Walt Disney (born Walter Elias Disney; December 5, 1901–December 15, 1966) was a cartoonist and entrepreneur who developed a multibillion-dollar family entertainment empire. Disney was the renowned creator of Mickey Mouse, the first sound cartoon, the first Technicolor cartoon, and the first feature-length cartoon. In addition to winning 22 Academy Awards in his lifetime, Disney also created the first major theme park: Disneyland in Anaheim, California. 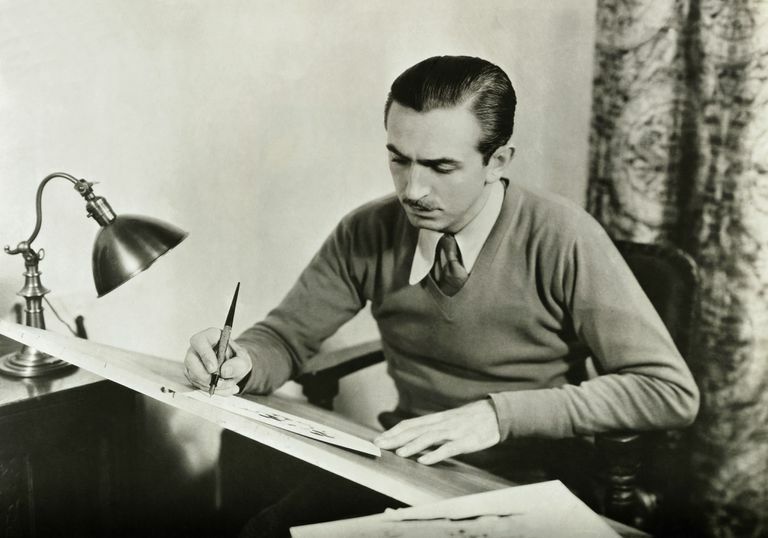 Known For: Disney was a pioneering animator and film producer who won 22 Academy Awards and built one of the largest media empires in the world. Walt Disney was born the fourth son of Elias Disney and Flora Disney (née Call) in Chicago, Illinois, on December 5, 1901. By 1903, Elias, a handyman and carpenter, had grown weary of crime in Chicago; thus, he purchased and moved his family to a 45-acre farm in Marceline, Missouri. Elias was a stern man who administered “corrective” beatings to his five children; Flora soothed the children with nightly readings of fairy tales. After the two eldest sons grew up and left home, Walt Disney and his older brother Roy worked the farm with their father. In his free time, Disney made up games and sketched the farm animals. In 1909, Elias sold the farm and purchased an established newspaper route in Kansas City, where he moved his remaining family. It was in Kansas City that Disney developed a love for an amusement park called Electric Park, which featured 100,000 electric lights illuminating a roller coaster, dime museum, penny arcade, swimming pool, and a colorful fountain light show. Rising at 3:30 a.m. seven days per week, eight-year-old Walt Disney and brother Roy delivered the newspapers, taking quick naps in alleyways before heading to Benton Grammar School. In school, Disney excelled in reading; his favorite authors were Mark Twain and Charles Dickens. In art class, Disney surprised his teacher with original sketches of flowers with human hands and faces. After stepping on a nail on his newspaper route, Disney had to spend two weeks in bed recuperating. He spent his time reading and drawing newspaper-style cartoons. Elias sold the newspaper route in 1917 and bought a partnership in the O-Zell Jelly factory in Chicago, moving Flora and Walt with him (Roy had enlisted in the U.S. Navy). Sixteen-year-old Walt Disney attended McKinley High School, where he became the school newspaper’s junior art editor. To pay for evening art classes at the Chicago Academy of Fine Arts, he washed jars in his father’s jelly factory. Wanting to join Roy who was fighting in World War I, Disney tried to join the army; however, at age 16 he was too young. Undeterred, Walt Disney decided to join the Red Cross’ Ambulance Corps, which took him to France and Germany. After spending 10 months in Europe, Disney returned to the U.S. In October 1919, he got a job as a commercial artist at the Pressman-Rubin Studio in Kansas City. Disney met and became friends with fellow artist Ub Iwerks at the studio. When Disney and Iwerks were laid off in January 1920, they formed Iwerks-Disney Commercial Artists. Due to a lack of clients, however, the duo only survived for about a month. After getting jobs at the Kansas City Film Ad Company as cartoonists, Disney and Iwerks began making commercials for movie theaters. Disney borrowed a camera from the studio and began experimenting with stop-action animation in his garage. He shot footage of his animal drawings using different techniques until the pictures actually “moved” in fast and slow motion. His cartoons (which he called Laugh-O-Grams) eventually became superior to the ones he was working on at the studio; he even figured out a way to merge live action with animation. Disney suggested to his boss that they make cartoons, but his boss flatly turned down the idea, content with making commercials. In 1922, Disney quit the Kansas City Film Ad Company and opened a studio in Kansas City called Laugh-O-Gram Films. He hired a few employees, including Iwerks, and sold a series of fairy tale cartoons to Pictorial Films in Tennessee. Disney and his staff began work on six cartoons, each one a seven-minute fairy tale that combined live action and animation. Unfortunately, Pictorial Films went bankrupt in July 1923; as a result so did Laugh-O-Gram Films. Next, Disney decided he would try his luck at working in a Hollywood studio as a director and joined his brother Roy in Los Angeles, where Roy was recovering from tuberculosis. Having no luck getting a job at any of the studios, Disney sent a letter to Margaret J. Winkler, a New York cartoon distributor, to see if she had any interest in distributing his Laugh-O-Grams. After Winkler viewed the cartoons, she and Disney signed a contract. On October 16, 1923, Disney and Roy rented a room at the back of a real estate office in Hollywood. Roy took on the role of accountant and cameraman of the live action; a little girl was hired to act in the cartoons; two women were hired to ink and paint the celluloid, and Disney wrote the stories and drew and filmed the animation. By February 1924, Disney had hired his first animator, Rollin Hamilton, and moved into a small storefront with a window bearing the sign “Disney Bros. Studio.” Disney’s "Alice in Cartoonland" reached theaters in June 1924. In early 1925, Disney moved his growing staff to a one-story, stucco building and renamed his business “Walt Disney Studio.” Disney hired Lillian Bounds, an ink artist, and began dating her. On July 13, 1925, the couple married in her hometown of Spalding, Idaho. Disney was 24; Lillian was 26. Meanwhile, Margaret Winkler also married, and her new husband, Charles Mintz, took over her cartoon distribution business. In 1927, Mintz asked Disney to rival the popular “Felix the Cat” series. Mintz suggested the name “Oswald the Lucky Rabbit” and Disney created the character and made the series. In 1928, when costs became increasingly high, Disney and Lillian took a train trip to New York to renegotiate the contract for the popular Oswald series. Mintz countered with even less money than he was currently paying, informing Disney that he owned the rights to Oswald the Lucky Rabbit and that he had lured most of Disney’s animators to come work for him. Shocked, shaken, and saddened, Disney boarded the train for the long ride back. In a depressed state, he sketched a character and named him Mortimer Mouse. Lillian suggested the name Mickey Mouse instead. Back in Los Angeles, Disney copyrighted Mickey Mouse and, along with Iwerks, created new cartoons with Mickey Mouse as the star. Without a distributor, though, Disney could not sell the silent Mickey Mouse cartoons. In 1928, sound became the latest in film technology. Disney pursued several New York film companies to record his cartoons with this new novelty. He struck a deal with Pat Powers of Cinephone. Disney provided the voice of Mickey Mouse and Powers added sound effects and music. Powers became the distributor of the cartoons and on November 18, 1928, "Steamboat Willie" opened at the Colon Theater in New York. It was Disney’s (and the world’s) first cartoon with sound. "Steamboat Willie" received rave reviews and audiences everywhere adored Mickey Mouse. In 1929, Disney began making “Silly Symphonies,” a series of cartoons that included dancing skeletons, the Three Little Pigs, and characters other than Mickey Mouse, including Donald Duck, Goofy, and Pluto. In 1931, a new film-coloring technique known as Technicolor became the latest in film technology. Until then, everything had been filmed in black and white. To hold off the competition, Disney paid to hold the rights to Technicolor for two years. He filmed a Silly Symphony titled "Flowers and Trees" in Technicolor, showing colorful nature with human faces, and the film won the Academy Award for Best Cartoon of 1932. On December 18, 1933, Lillian gave birth to Diane Marie Disney, and on December 21, 1936, Lillian and Walt Disney adopted Sharon Mae Disney. Disney decided to add dramatic storytelling to his cartoons, but making a feature-length cartoon had everyone (including Roy and Lillian) saying it would never work; they believed audiences just wouldn’t sit that long through a dramatic cartoon. When it premiered in theaters on December 21, 1937, though, "Snow White and the Seven Dwarfs" was a box office sensation. Despite the Great Depression, it earned $416 million. A notable achievement in cinema, the movie won Disney an Honorary Academy Award. The citation read, "For 'Snow White and the Seven Dwarfs,' recognized as a significant screen innovation which has charmed millions and pioneered a great new entertainment field." After the success of "Snow White," Disney constructed his state-of-the-art Burbank Studio, deemed a worker’s paradise for a staff of about a thousand workers. The studio, with animation buildings, sound stages, and recording rooms, produced "Pinocchio" (1940), "Fantasia" (1940), "Dumbo" (1941), and "Bambi" (1942). Unfortunately, these feature-length cartoons lost money worldwide due to the start of World War II. Along with the cost of the new studio, Disney found himself in debt. He offered 600,000 shares of common stock, sold at five dollars apiece. The stock offerings sold out quickly and erased the debt. Between 1940 and 1941, movie studios began unionizing; it wasn’t long before Disney’s workers wanted to unionize as well. While his workers demanded better pay and working conditions, Disney believed that his company had been infiltrated by communists. After numerous and heated meetings, strikes, and lengthy negotiations, Disney finally became unionized. However, the whole process left Disney feeling disillusioned and discouraged. With the union question finally settled, Disney was able to turn his attention back to his cartoons; this time for the U.S. government. The United States had joined World War II after the bombing of Pearl Harbor and it was sending millions of young men overseas to fight. The U.S. government wanted Disney to produce training films using his popular characters; Disney obliged, creating over 400,000 feet of film (about 68 hours). After the war, Disney returned to his own agenda and made "Song of the South" (1946), a movie that was 30 percent animation and 70 percent live action. "Zip-A-Dee-Doo-Dah" was named the best movie song of 1946 by the Academy of Motion Picture Arts & Sciences, while James Baskett, who played the character of Uncle Remus in the movie, won an Oscar. In 1947, Disney decided to make a documentary about Alaskan seals titled "Seal Island" (1948). It won an Academy Award for best two-reel documentary. Disney then assigned his top talent to make "Cinderella" (1950), "Alice in Wonderland" (1951), and "Peter Pan" (1953). After building a train to ride his two daughters around his new home in Holmby Hills, California, Disney began formulating a dream in 1948 to build Mickey Mouse Amusement Park across the street from his studio. He visited fairs, carnivals, and parks around the world to study the choreography of people and attractions. Disney borrowed on his life insurance policy and created WED Enterprises to organize his amusement park idea, which he was now referring to as Disneyland. Disney and Herb Ryman drew out the plans for the park in one weekend. The plan included an entrance gate to "Main Street" that would lead to Cinderella’s Castle and off to different lands of interest, including Frontier Land, Fantasy Land, Tomorrow Land, and Adventure Land. Roy visited New York to seek a contract with a television network. Roy and Leonard Goldman reached an agreement where ABC would give Disney a $500,000 investment in Disneyland in exchange for a weekly Disney television series. ABC became a 35 percent owner of Disneyland and guaranteed loans up to $4.5 million. In July 1953, Disney commissioned the Stanford Research Institute to find a location for his (and the world’s) first major theme park. Anaheim, California, was selected since it could easily be reached by freeway from Los Angeles. Previous movie profits were not enough to cover the cost of building Disneyland, which took about a year to build at a cost of $17 million. Roy made numerous visits to the Bank of America's headquarters to secure more funding. On July 13, 1955, Disney sent out 6,000 exclusive guest invitations, including to Hollywood movie stars, to enjoy the opening of Disneyland. ABC sent cameramen to film the opening. However, many tickets were counterfeited and 28,000 people showed up. Rides broke down, food stands ran out of food, a heat wave caused freshly poured asphalt to capture shoes, and a gas leak caused temporary closings in a few themed areas. Despite the newspapers referring to this cartoon-ish day as "Black Sunday," guests from all over the world loved it and the park became a major success. Ninety days later, the one-millionth guest passed through the park's turnstile. In 1964, Disney’s "Mary Poppins" premiered; the film was nominated for 13 Academy Awards. With this success, Disney sent Roy and a few other Disney executives to Florida in 1965 to purchase land for another theme park. In October 1966, Disney gave a press conference to describe his plans for building an Experimental Prototype Community of Tomorrow (EPCOT) in Florida. The new park would be five times the size of Disneyland, and it would include shopping, entertainment venues, and hotels. The new Disney World development would not be completed, however, until five years after Disney’s death. The new Magic Kingdom (which included Main Street USA; Cinderella's Castle leading to Adventureland, Frontierland, Fantasyland, and Tomorrowland) opened on October 1, 1971, along with Disney's Contemporary Resort, Disney's Polynesian Resort, and Disney's Fort Wilderness Resort & Campground. EPCOT, Walt Disney’s second theme park vision, which featured a future world of innovation and a showcase of other countries, opened in 1982. In 1966, doctors informed Disney that he had lung cancer. After having a lung removed and several chemotherapy sessions, Disney collapsed in his home and was admitted to St. Joseph’s Hospital on December 15, 1966. He died at 9:35 a.m. from an acute circulatory collapse and was buried at Forest Lawn Memorial Park in Glendale, California. Disney left behind one of the largest media empires in the world. Since his death, the Walt Disney Company has only grown; today, it employs over 200,000 people and generates billions in revenue each year. For his artistic achievements, Disney amassed 22 Oscars and numerous other honors. In 1960, he was given two stars on the Hollywood Walk of Fame (one for his film and one for his television work). David, Erica, and Bill Robinson. "Disney." Random House, 2015. "The Disneyland Story." Walt Disney Productions, 1985. How Did Walt Disney Get the Idea for Disneyland?